Today marks the end of my third week in Salamanca, Spain. Over the course of the last three weeks, I have been in touch with many of my friends and family from home, talking, texting, or video-chatting, and each time, understandably, they all ask the same thing: “How’s Spain?” What a question! Loaded, without a doubt. Knowing that the person who has asked me this question probably doesn’t have 12 hours to talk on the phone, one must be prepared to condense; that’s to say, you’ve got to come up with a script: “Things are good”, “I’m making friends”, “I’m having fun”, or my personal favorite, simply, “Good”. The truth is that although some things have been difficult, each day has brought innumerable surprises, joys, and most importantly, “firsts”, that could not possibly be entirely articulated in any phone call, text message, or work of art. But we have to do something, right? After all, people want to see at the very least the highlight reel. I went to Seville, Spain. 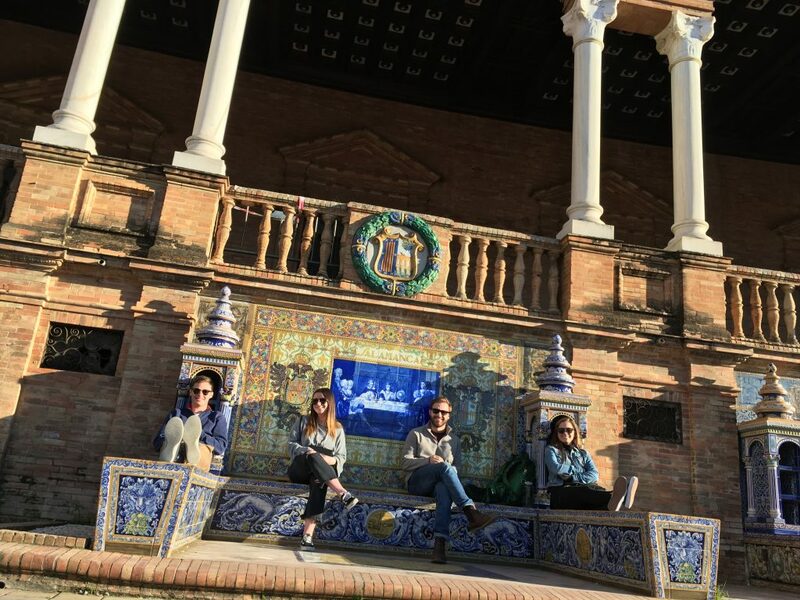 A couple of friends and I took a 7 hour bus and stayed the long weekend in Seville. 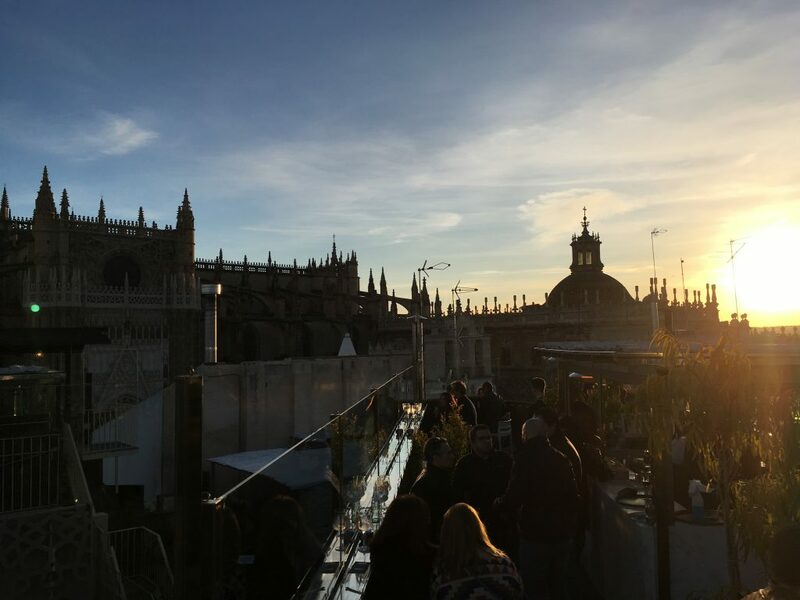 It was a marvelous city that I could best describe as being like Disney World – orange and palm trees every ten feet, castles filling the sky, smell of churros filling the air, thousands of people from all ethnicities crowding the cobblestone streets, and everybody speaking in English. It was a surreal town with a lot to offer. I had my first lecture and “office hours” with a Spanish professor. I never really considered that I would be integrated into the Spanish academic institution. To my surprise, instead of being a tourist visitor in classes at the local university, I was a name, a person, a real student, sitting among a hundred local Spaniards learning about the psychology of groups. I watched my first “real football” game in a Spanish soccer bar with five spanish friends. Not only do I never watch soccer, but they don’t teach you soccer vocabulary in class, or proper soccer etiquette (of which there seems to be none). For the first time in my life, I felt like a true outsider, barely understanding a word being shouted across the table as the owner of the bar played Barcelona’s victory song over the loudspeakers for the third time. I went to a Spanish play. My mom invited me to watch her brother perform in a play. I accepted. I shocked myself at how much I enjoyed it – all three hours of it- accompanied only by two middle aged spanish women. I volunteer weekly at an Oxfam outlet (a fair-trade store). I sit there for three hours at a time selling fair-trade coffee and chocolates to passerbys and listen to (typical) Salmantino gossip of the town. It has been quite a “first” experience for me. I went to an eye doctor who didn’t speak English. Since I left my glasses at home, I had to get a new prescription (my eyes aren’t that bad, I just like to have them for class to read the board). I was so thankful for my 6th grade Spanish class as I was reciting the Spanish alphabet to the doctor, who was covering my left eye with a spoon. 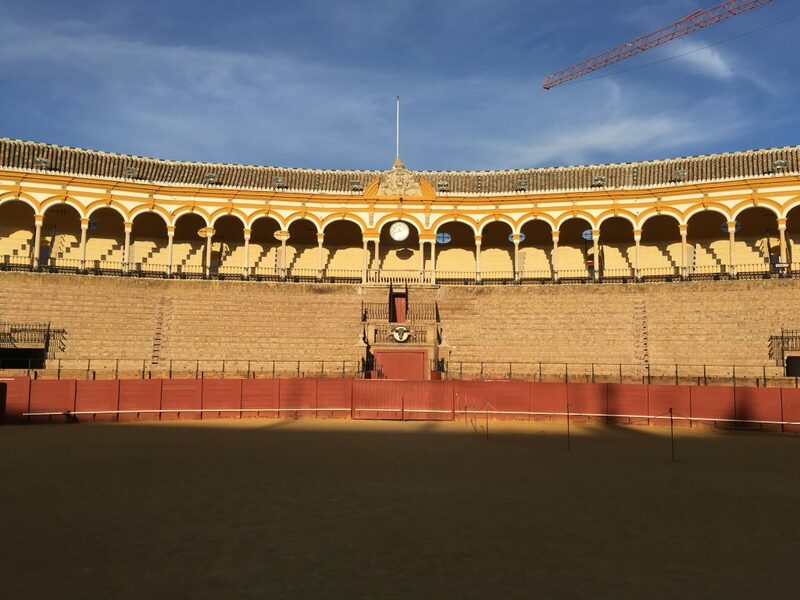 I visited a bull-fighting ring: La Plaza de Toros. Regardless of how you feel about this controversial sport, the history is just plain cool. I think these very few “firsts” (and you can be sure I’m leaving out many) paint the most accurate depiction of my life over the last three weeks. It’s been pretty hard to tell about my “daily life” or “routine” here simply for the fact that every day has been a new adventure. There have surely been rough patches of adjustment, of cultural clashes, misunderstandings, and homesickness, but they have all been made insignificant by the beauty of each new day, filled with new and brilliant experiences that I am so privileged to unwrap. All this being said, it can get pretty easy to adopt an egotistical perspective here. “Let me tell you all about my crazy awesome life, oh and by the way, your life has been probably on pause since I left home, right?” Well, to those of you who feel like us “abroaders” are ignorant to the challenges and joys of your daily life at home in the U.S., I apologize on our behalf. Truly. Although I want to continue to talk, text, and video-chat about my new and exciting adventures- my firsts – with people back home, I also want to hear about yours; because the truth is that life doesn’t stop just because we’re not there. I have learned over the past few weeks that it is just as hard to describe my experiences here as it is for my friends and family to tell me about their experiences at home – and thus is the abroad experience – people trying desperately, and often failing, to share with one another. I hope that with these small lines, I have shared something of my experience – and I await to hear of yours.